No surprise to see on-pacer PAGO BAY run well first up. Showed a bit as a two-year-old and has form around some reasonable types, and although she lost her rider shortly after jumping in a Lark Hill 25/3 barrier trial, she obviously took no harm from the incident, and trainer Neville Parnham will have her ready to fire fresh. Maps well and worth a ticket each way. Peters Investments filly MORNING SONG will be all the rage and stands out as the horse to beat first up. Was a touch plain on her Lark Hill 1/4 trial, but she was probably just blowing out the cobwebs, and the solid workout should bring her forward for this fresh assignment. PEARL DANCER boxed on well after finding the front in a similar event to this last start and with a clean getaway from gate one should be able to hold the lead again. Has to be a top-four contender, as does fellow on-pacer OVERTHRONE, who hasn’t missed a place in four runs this prep and has been freshened since her competitive effort on Esperance Cup Day. Suggested: 7. PAGO BAY win. Have been impressed with the two 1450-metre trial efforts of IMPI and he’s going to take some beating on debut. The Justin Warwick-trained four-year-old ran into trouble and should’ve finished closer in his Lark Hill 25/3 heat, prior to leading and comfortably holding off smart city-winner Stoicism in his Lark Hill 1/4 heat, covering the ground stylishly. Expecting positive tactics from the low draw and this looks a nice option for him to kick off his racing career. William Pike goes on SULPHUR CRESTED and this filly will no doubt attract plenty of support. Was strong to the line behind the promising Shuwish at Ascot last start and from a sweet draw, ‘The Wizard’ should give her every opportunity. DIFFUSION got back in a race dominated by the on-pace brigade first-up at Ascot 27/3 and expecting an improved performance from him here, while have been tracking DELECTABLE DOLLY recently and if she can hold a position early, she can make things interesting late. He will be short, but this does look the race for LOOKOUT to record an overdue maiden victory. Was a moral beaten over 1000 metres here three back, before two solid efforts against quality opposition in town. With a clean getaway, he should be able to find a suitable running position somewhere in the first four/five, and with even luck from there he’ll likely be a bit too good for these. First-upper COOL FROST has her share of ability though and looked the goods when comfortably winning her Lark Hill 25/3 trial. Placed in a decent Bunbury 5/12/18 maiden on debut also and she stands out as the logical danger. Victorian import MISTER KRUMPETS did a few things wrong first up in WA, but there was merit to the effort and he will no doubt be better for the run. Have to always respect Team Williams, while first-starter ICE TRADE hails from a top local stable and has shown enough in her two trials to warrant consideration. Has the gate speed to make the most of barrier one also. Anticipating a big second-up effort from REXFORD. Liked his trial efforts behind Early Explorer and Ginger Mack, but he was never in contention when snagged back to last from barrier 14 on debut at Ascot 27/3. Did made up good ground in the mid-race (800m-400m) and over the final 400 metres also, with his sectionals reading well, and expecting Jason Whiting to have him positioned much closer to the lead from the lower draw here. Can give this a shake. CINNAMON RUN has been freshened since stretching Geographe Bay all the way in a similar event to this last month and his previous effort behind Jedaffair reads well. Pike jumps on to replace the injured Clint Johnston-Porter and this fellow has to rate among the major players. VENGEANCE OF WAR is well-regarded and has been heavily supported at both runs this prep, however, he hasn’t quite lived up to market expectations. No surprise to see him improve with blinkers on coming back in distance though, while TESTA DE LAGO is having his first run for Fenella Martin, has obvious issues, but his best form puts him right in the finish. Suggested: 11. REXFORD each way. Thinking PARTY NIGHT can bounce straight to the front and give these something to catch. Trialled well for new trainer Michael Lane and showed brilliant gate speed to lead first up at Ascot 27/3, but she peaked on her run and faded to finish fifth. Expecting that effort to bring her forward and she should be able to lead these without burning as much fuel early. BRINGON THE VEUVE was heavily commissioned first up and recorded a strong victory, racing outside leader in transit and drawing clear late. Got the job done very well on that occasion and that performance suggests she’s going to take a power of beating again. HORIZON comes back to the track/distance that he knocked off Lookout to win on debut last month. Follow-up effort was solid enough and has the service of in-form apprentice Jade McNaught, while DOSHRIKE encountered traffic issues here last start and should’ve finished closer to the winner on that occasion. Suggested: 3. PARTY NIGHT win. Went looking for something to beat her, but all things being equal, LAVISTARR really should be winning again. Enjoyed the run of the race to record her maiden victory over this track/distance two weeks back, and while she had plenty in her favour on that occasion, it should have provided her with a significant confidence boost. With an even tempo anticipated, she maps to get every chance again for Chris Parnham and she is improving every time she heads to the races. First-upper THROWDOWN is a promising stayer in the making and is expected to maker his presence felt in this. Showed plenty during his initial racing campaign and improved nicely at his second lead-up barrier trial at Lark Hill 1/4. Will be doing his best work late. Didn’t mind the effort of GROOVERSHAKER in a competitive Class 1 event last start and he’s racing his way towards a peak performance, while SAXY FILLY comes through the same race and with a patient ride, can finish top four at her first attempt at the mile. THREE SECRETS has endured one of the more frustrating preparations you’ll see, but this does look his race to get back into the winner’s circle. Has raced really well on the comeback from knee surgery and probably should’ve won a couple of his five starts this campaign, but he hasn’t been able to get the job done, despite being heavily supported on most occasions. Important to note that he was scratched behind the gates when found to be lame at Albany 31/03, but if he’s happy-and-healthy, and with the run he’s likely to enjoy, he really should be saluting. Thought the Ascot 16/3 fresh effort of GET THE VIBE was full of merit, when leading for the most part, before being over-run by the flying Diablerie late. Apprentice Jade McNaught should send this mare straight to the front and she’ll take some catching. Big-finishing local mare SNOW BLOSSOM is resuming from a break, and will no doubt drift back and swoop late, while STAR GLITTER looks well placed back in this grade and apprentice Brandon Louis should be able to hold a reasonable running position beginning from barrier one. Suggested: 4. THREE SECRETS win. Quite a few hopes in this 2200-metre event to finish the 2018/19 Bunbury Turf Club season and happy to side with WITCHERY WOMAN. Is a bit of a quirky type, who has had her struggles over the journey, but she really should’ve gone close to winning over this distance at Ascot 27/3 and that run should bring her forward for this assignment. LENNON’S SONG is being stretched out to a middle-distance at her third run back from a break, but should still be competitive. Have liked both efforts so far this prep and she should be working home into a top-four finish. PLEAD THE FIFTH is unbeaten in two runs at this track and is a chance to win the BTC Horse Of The Year Award. She looks ready to step up to this trip at this stage of her prep and is better placed back in this company, while MR STIKLER took on WA Derby types in the Melvista Stakes last time, but is suited back in this grade and should enjoy a sweet run in transit from the low draw. Suggested: 7. WITCHERY WOMAN each way. 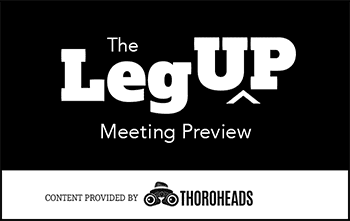 The Leg Up is provided by Thoroheads — Digital content producers servicing the Western Australian Thoroughbred Horse Racing Industry. Disclaimer: The opinions expressed in this article are the author’s own and do not reflect the view of the Bunbury Turf Club.